GoPro ready, fog-free with full view, RKD™ Snorkel Mask helps you capture the best of both worlds on land and the sea. Excellent for snorkeling & spearfishing! World-Wide shipping & tracking numbers provided. Introducing the all-new Gen™ 2 Snorkel Mask from RKD, featuring a clear view given its built-in anti-fog properties for the ultimate experience in all your adrenaline pumped water sports. Great for the adventure junkie, the dive master and the reef connoisseur, for adults and children alike to have the ultimate experience on their travels. Love traveling and packing up your best gear? Take it with you anywhere you go and mount a GoPro action camera to capture your best experiences, stunts and most exhilarating thrills. The innovative dry-top technology allows you to breathe temporarily underwater. The mask prevents water entry while submerged. Water leakage can be drained off by the drain valve by lifting the head up. Its full face design provides both a comfortable experience underwater and protection for your face. You will take your snorkeling, diving and spearfishing to another level! A durable mount allows you to attach a GoPro or action camera. With its double air-flow-channel your mask will stay clear as you exhale and inhale from different channels, preventing fogging and leakage. The broadside dual sealing system imitates the contour of your face and provides great comfort with its liquid silicone preventing skin irritation. The mask’s 180 degree wide view brings an anti-impact safety window for good vision, a breathing tube with dry-top technology to breathe temporarily freely under water, a drain valve inside the mask helps to drain water by simply raising your head up, four adjustable elastic fabric headbands to adjust to all head sizes. 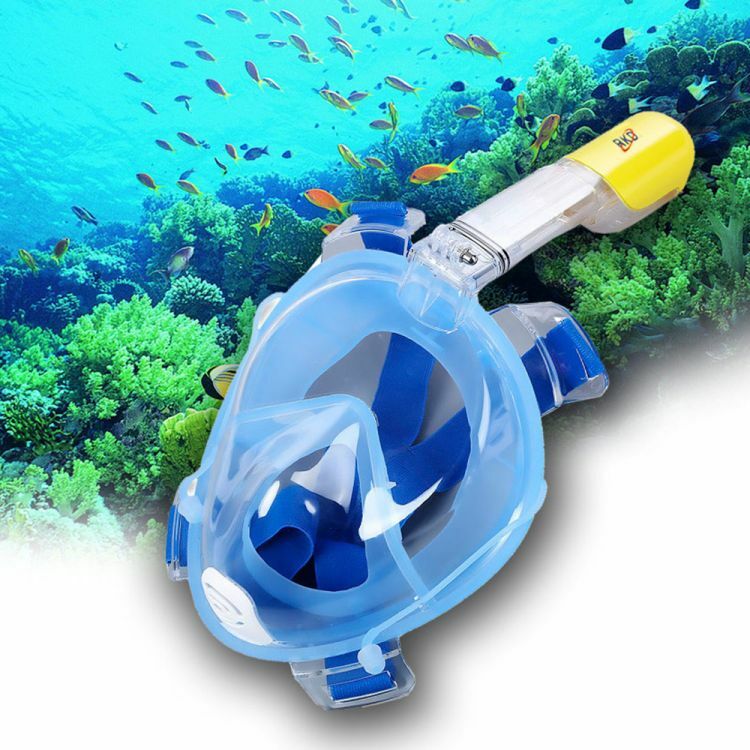 Ideal for diving, swimming, snorkeling and all underwater sports. Limited units available. Due to the nature of our promotions, if you see a page “out-of-stock” then message us and we will let you know when we get more items on stock! * This item qualifies USA Expedited Shipping for the continental USA and certain countries, colors and sizes (select at checkout). We ship worldwide and include insured shipping. Tracking numbers will be generated and provided upon request.